QUICK PICK OPTION: You can play the PowerBall/ PowerBall Plus game by choosing a Quick Pick option where the Lottery processing system randomly chooses 6 lucky numbers for you. 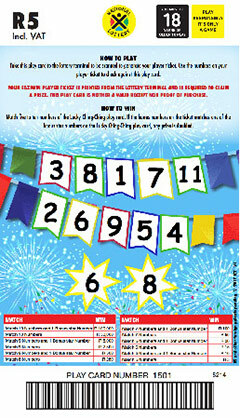 You can manually choose your lucky numbers by following these easy steps. Find a valid POWERBALL Betslip. Using a pen / pencil, choose 5 numbers from 1 to 50 and 1 extra number from 1 to 20. Take your Betslip to a teller at an approved Lottery retailer to make your payment. You will receive a receipt from the teller with all your chosen numbers. Make sure you write your name on the back of the receipt. Look out for the next live PowerBall Draw on Etv, Tues/ Fri at 21h00 to see if you have won. You can play as many boards as you want. You can choose a Multi-Draw option which allows you to play the same numbers over multiple draws. A single PowerBall play will cost you R5.00 vat incl. 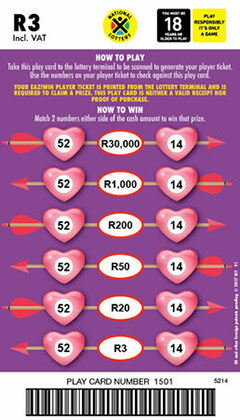 A single cost of PowerBall PLUS will be R2.50 vat incl. ATTENTION: With effect from 1 April 2018, the VAT levied on purchasing any of the National Lottery games is no longer at 14% as may be seen in any of our marketing material. Due to the legislation change to our VAT, kindly note our new VAT value will be 15%. 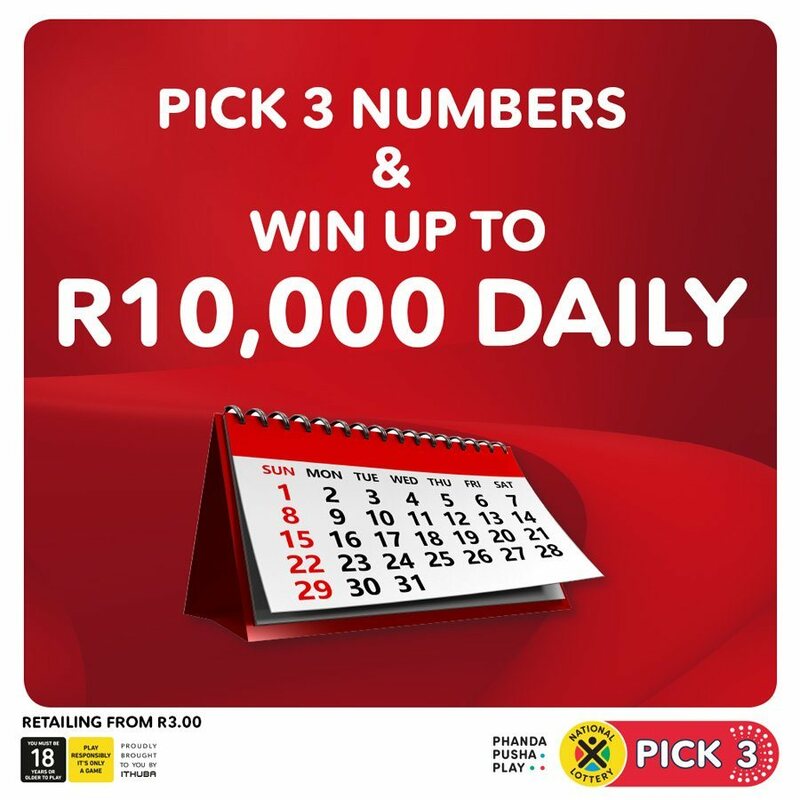 Step 1: Visit your nearest National Lottery EaziWin selling retailer. 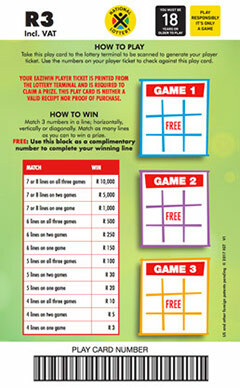 Step 2: Select your preferred EaziWin game play card and give it to the cashier. Step 3: The cashier will scan your selected play card and a ticket with unique game numbers/symbols will be printed from the terminal. 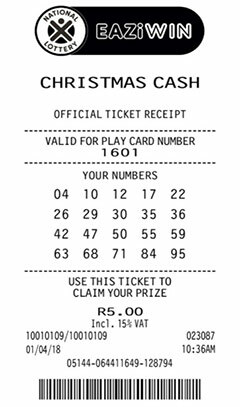 Step 4: Match the numbers/symbols at the back of the play card with the numbers on your receipt. 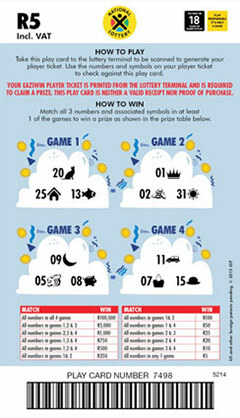 Step 5: Check the prize table at the back of the play card to see how much you have won. 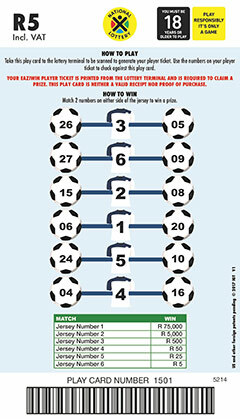 Alternatively, follow the game instructions at the back of the play card or visit www.nationallottery.co.za for more information. 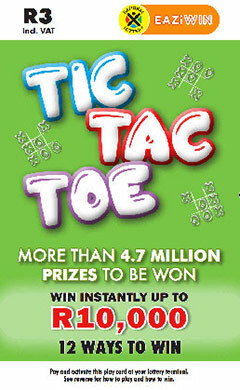 Step 1: Purchase your Tic Tac Toe play card from any participating retailer. 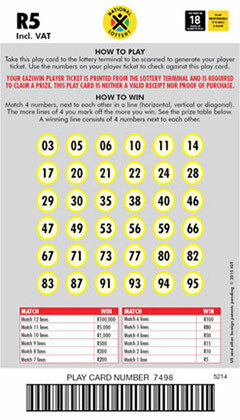 Step 2: Match 3 numbers, (vertically, horizontally and diagonally) on your play card with that on your unique terminal generated ticket. The “FREE” gives you a chance to match more combination of numbers. Disclaimer: All images of the receipt/tickets are for display purposes and cannot be used for retail / gaming purposes. A ticket is deemed valid when the play card number on your receipt/ticket matches the play card number on the back of your selected play card. 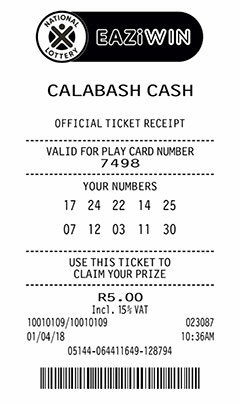 Take your Calabash Cash play card to a National Lottery terminal to be scanned and a receipt/ticket will be generated, this receipt/ticket is required to claim your prize. Use the numbers on your receipt/ticket to check against your Calabash Cash play card. 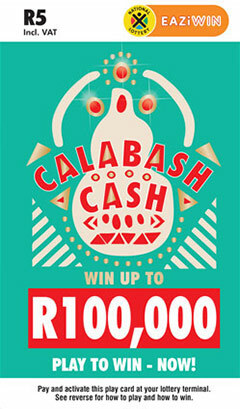 The Calabash Cash play card is neither a valid receipt/ticket nor proof of purchase. 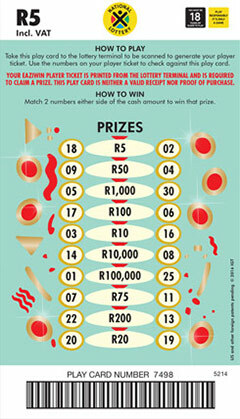 Match 2 numbers on either side of the cash amount to win that prize. Take your Popa Feela play card to a National Lottery terminal to be scanned and a receipt/ticket will be generated, this receipt/ticket is required to claim your prize. Use the numbers on your receipt/ticket to check against your Popa Feela play card. 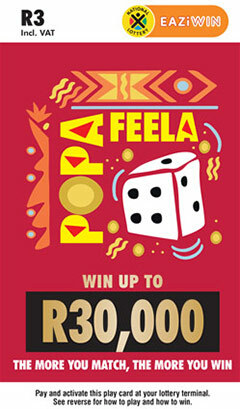 The Popa Feela play card is neither a valid receipt/ticket nor proof of purchase. 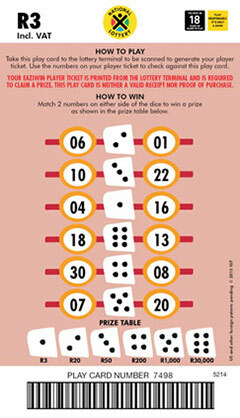 Match 2 numbers on either side of the dice to win a prize as shown in the prize table. 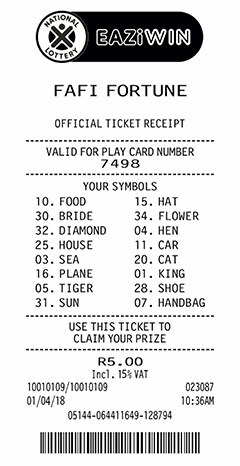 Take your Balloon Bonanza play card to a National Lottery terminal to be scanned and a receipt/ticket will be generated, this receipt/ticket is required to claim your prize. 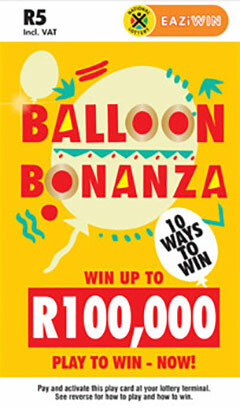 The Balloon Bonanza play card is neither a valid receipt/ticket nor proof of purchase. 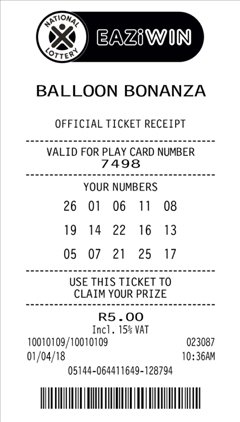 Use the numbers on your receipt/ticket to check against your Balloon Bonanza play card. Match 3 balloons of the same colour. 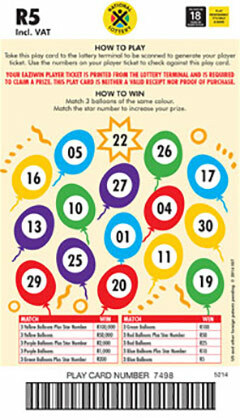 Match the star number to increase your prize. Disclaimer: All images of the receipt/tickets are or display purposes and cannot be used for retail / gaming purposes. A ticket is deemed valid when the play card number on your receipt/ticket matches the play card number on the back of your selected play card. 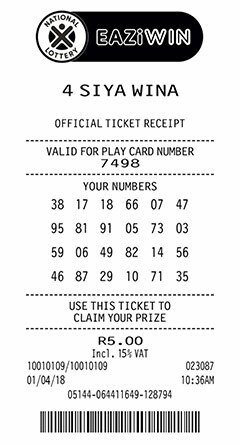 Take your 4 Siya Wina play card to a National Lottery terminal to be scanned and a receipt/ticket will be generated, this receipt/ticket is required to claim your prize. Use the numbers on your receipt/ticket to check against your 4 Siya Wina play card. 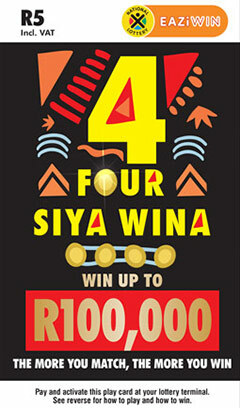 The 4 Siya Wina play card is neither a valid receipt/ticket nor proof of purchase. Match 4 numbers, next to each other in a line (horizontal, vertical or diagonal). The more lines of 4 you mark off, the more you win. A winning line consists of 4 numbers next to each other. 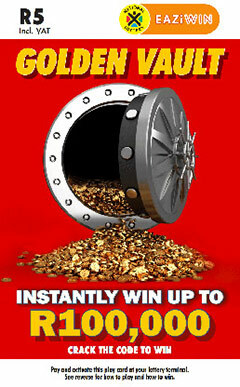 Step 1: Purchase your Golden Vault play card from any participating retailer. 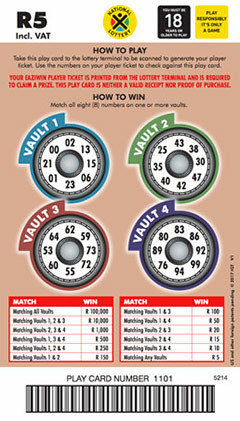 Step 2: Match 8 numbers on one or more vaults against the numbers on your unique terminal generated ticket. 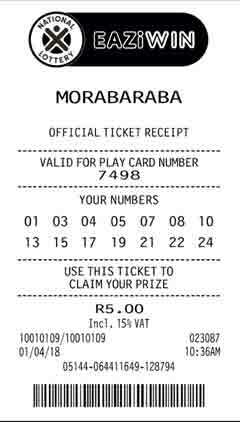 Take your Morabaraba play card to a National Lottery terminal to be scanned and a receipt/ticket will be generated, this receipt/ticket is required to claim your prize. Use the numbers on your receipt/ticket to check against your Morabaraba play card. 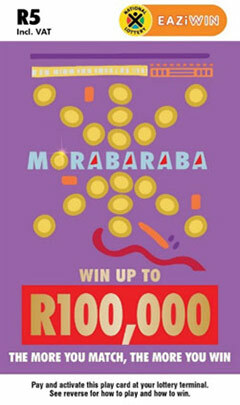 The Morabaraba play card is neither a valid receipt/ticket nor proof of purchase. 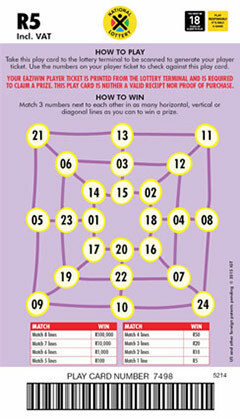 Match 3 numbers next to each other in as many horizontal, vertical or diagonal lines to win a prize. 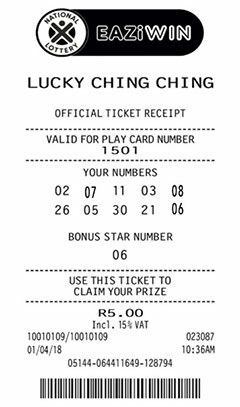 Take your Fafi Fortune play card to a National Lottery terminal to be scanned and a receipt/ticket will be generated, this receipt/ticket is required to claim your prize. Use the numbers on your receipt/ticket to check against your Fafi Fortune play card. 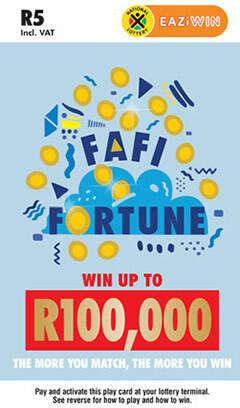 The Fafi Fortune play card is neither a valid receipt/ticket nor proof of purchase. 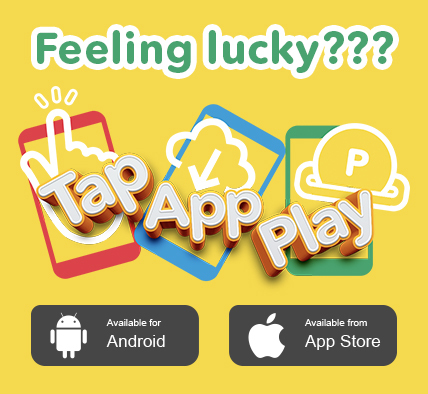 Match all 3 numbers and associated symbols in at least 1 of the games to win a prize as shown in the prize table on the Fafi Fortune play card. 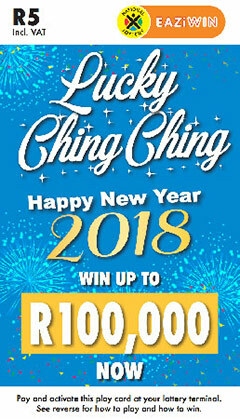 Step 1: Purchase your Lucky Ching-Ching play card from any participating retailer. 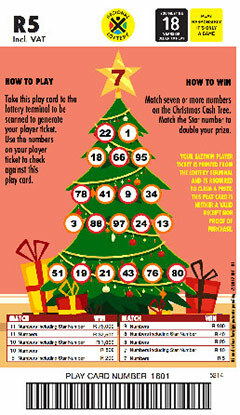 Step 2: Match 5-10 numbers on your play card with that on your unique terminal generated ticket. The numbers on the stars double your winnings. 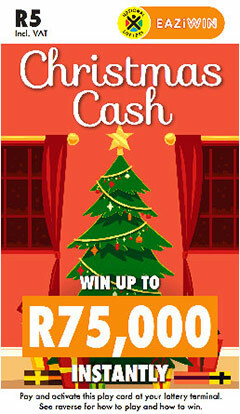 Step 1: Purchase your Christmas Cash play card from any participating retailer. Step 2: Match 7 or more balls, on your play card with that on your unique terminal generated ticket. The number on the star doubles your winnings. 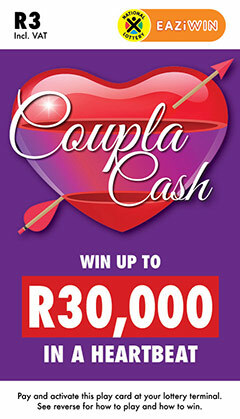 Step 1: Purchase your Coupla Cash play card from any participating retailer. Step 2: Match 2 numbers on the hearts with the numbers on your unique terminal generated ticket, on either side of the cash amount, and win the specified amount on the card. 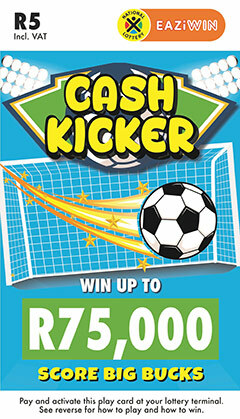 Step 1: Purchase your Cash Kicker play card from any participating retailer. Step 2: Match 2 numbers on either side of the soccer jerseys with the numbers on your unique terminal generated ticket, on either side of the cash amount, and win the specified amount on the card.